I had a hard time deciding wether or not to go to Ecuador. I was really sick from traveling in Costa Rica with my brand new fiancé. I came home with dengue fever and it had floored me, literally. I couldn't walk more than 30 feet without laying down, I lost over 10 lbs in 5 days, I didn't eat anything for 3 days. I had a 103 fever for around five days and after my fever broke I got a savage rash on my legs that looked like I was bleeding out from the inside. It also felt like there were ants under my skin crawling and biting me up and down my legs. It was the most uncomfortable I had been in a very long time. As the rash subsided, my appetite came back, my energy was still low but it was coming back. I had pushed my flight to Ecuador back by 3 days and I was pretty sure that I could make it down there. I knew i wouldn't have the energy or strength I usually have but I wanted to go so bad. I slowly packed my things to head out. It took a little bit, a few days, I could be active for about an hour then have to lay down and have a snack. I also think dengue made me really sensitive to blood sugar drops so the mornings were really, really hard. Delta sent me an email before I was supposed to leave and they had upgraded me to first class. It pays to fly a lot. That would make the 5 hour flight much more comfortable. Every day I was feeling stronger and stronger as the time came to head international again. I was in the states for a whole 6 days and was back on a plane, this time to Ecuador. Don't mind if I do. Thanks Delta!!! I had an awesome flight full of champagne, a down blanket, a full sized pillow and Magic Mike XXL (for you ladies out there, Channing Tatum... Need I say more?!!). Anyways, the flight was great and I landed safely and happily in Quito. A taxi met me, I headed to the hostel for the night in Quito. The next morning it was a 4 hour drive to Tena to meet up with the Small World Adventures crew and I wasn't expecting to be able to paddle. It had rained the night before, the water levels were high, Tosh texted me to tell me they were waiting a bit to kayak. I was still super weak and hadn't paddled since the Green Race so I didn't want to push it too much. 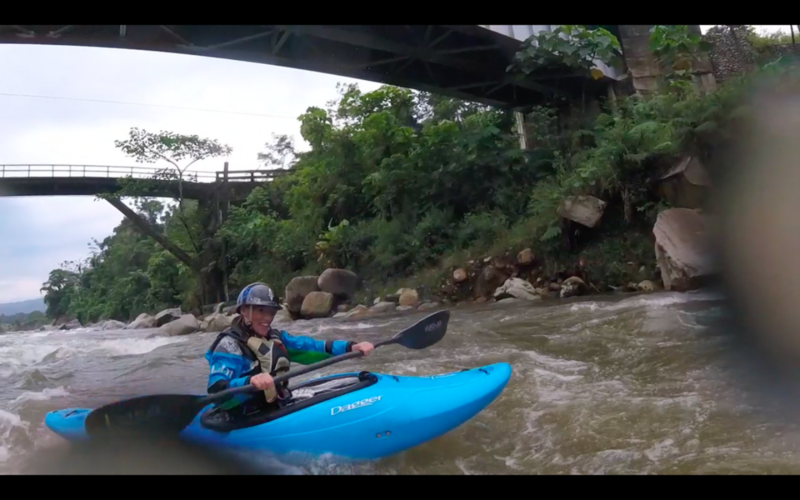 So, Jason McClure, Tosh, and I paddled high water upper Misualli which proved to be a pretty fun run with some bigger rapids. We got right in on it and I realized quickly that I had landed in the territory of a kayakers dream and dinosaur land. Even though I was trying to concentrate on staying upright and not passing out, I felt overwhelmed trying to watch the scenery go by. The rapids were world class drops at class 3-4 with some bigger rapids mixed in there. The perfect run for being sick only hours before. I have another two weeks here and I am so excited to share all of my adventures with everyone as the trip goes on. Ecuador is pretty known for being a beautiful place but it is filled with dense jungle and quickly changing weather conditions, making every day a grand adventure.